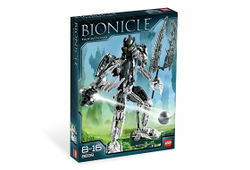 8699 Takanuva is a BIONICLE set released in July 2008. It contains 267 pieces. It contains Takanuva in his partly light-drained form after reaching Karda Nui, with a Midak Skyblaster, a Power Lance, and the altered Mask of Light. Takanuva is the Toa of Light. He can fire beams of light, banish darkness, create blinding flares and create holographic projections. He was briefly seen in this form, the Toa of Twilight, after being attacked by a shadow leech and having his light powers balanced with shadow due the exposure. He was later cured by exposing himself to the sonic scream of a Klakk, which shattered the shadow present in his body. This is a description taken from LEGO.com. Please do not modify it. (see an archive of the product's page) Toa of Light and Shadow! After surviving an attack by the Makuta, Takanuva now finds himself controlling both the power of Light and the power of Shadow! Granted even greater power by the energies of Karda Nui, this mighty hero is ready for the fight. Armed with a Midak Skyblaster and a three-pronged power lance, he is ready to challenge any enemy. Three-pronged power lance is 11"" (28cm) long! Takanuva stands 12"" (30cm) tall! Toa of Light and Shadow! This page was last edited on 10 January 2016, at 00:21.